Under the scorching sun rays what can be better than a sip of icy beverage? To feel the cold from its can with your hand and enjoy the feeling how it fills you with cold and total relax. Great picture, isn’t it? In this article we are going to speak about Corona coolers and Corona ice chests that will easily help you to make this dream picture come true. 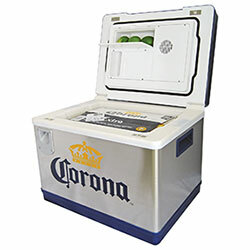 Corona coolers have appeared in the world coolers market not so long ago, and almost immediately become a very popular novelty thanks to its style and quality. These coolers will add fun and style to each party and make it awesome. 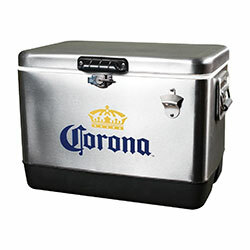 Available Corona Ice Chests. Let’s Compare! Our List of TOP 5 Corona Coolers. Only the Best Options for You. Firstly we want to note that Corona Coolers and Ice Chests are not the same as such premium coolers as Yeti’s or Pelican’s coolers for example. It makes no sense to compare them, because the Corona manufacturers have been focused on the coolers’ style when created this lineup, while manufacturers of such coolers as Pelican or Yeti were focused on the performance and duration of ice retention terms. Definitely all coolers from the Corona lineup are durable and effective, and each of them will easily cope with its main task-to keep the content cold, but you don’t have to expect them hold an ice during three weeks or more like these coolers can do . 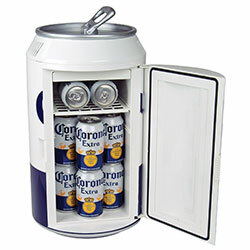 In this list you will find 5 the ‘coolest coolers’ from the famous Corona manufacturers. Welcome to our list of TOP 5 best cooler for you! First option in our list is Corona Stainless Steel Cooler with the capacity of 54-quart. At the world market you will find only two manufacturers that produce coolers made of stainless steel and with capacity of 54-quart– the Corona licensed CORIC-54 by Koolatron and identical model from Coleman manufacturer. Both these options are almost the same, the only difference between them is their dimensions. The Koolatron size is 23.5” x 16.2” x 16.8” while the model from Coleman manufacturer is a little bit larger, it has size of 24” x 16.5” x 15.7”. Other their characteristics are completely identical. Both these coolers have a capacity of 54 quart and made of stainless steel. Coolers are equipped with the durable handles, also made of stainless steel and steel secure latch on the cooler’s lid. Our team without any doubts recommends our readers the officially licensed CORIC-54 from Koolatron for purchasing. While reading Amazon reviews from users we didn’t find negative ones. People appreciate these coolers for their style, effectiveness and unique stainless steel design. So, it is aa excellent novelty which will make your next party unforgettable. The next participant of our list is this electric 48-quart iceless Corona cooler / mini-fridge by Koolatron that is extremely portable and convenient in using. Measures of this cooler are 23.2” x 17.4” x 18.4” and with capacity of 48-quart this mini-fridge can hold up to 80 bottles with your favorite beverages. This electric cooler should be plugged into 12-volt wall outlet and can chill its content to the 40-degrees below ambient temperature. Among additional useful features this cooler has built-in holders for drinks, special folding cutting board that is built into the cooler’s lid, and built-in opener for bottles that is really indispensable accessory in every party where are bottles with drinks. Speaking about cooler’s performance we can make a conclusion that this cooler excellently copes with its main task. It is very convenient and effective. 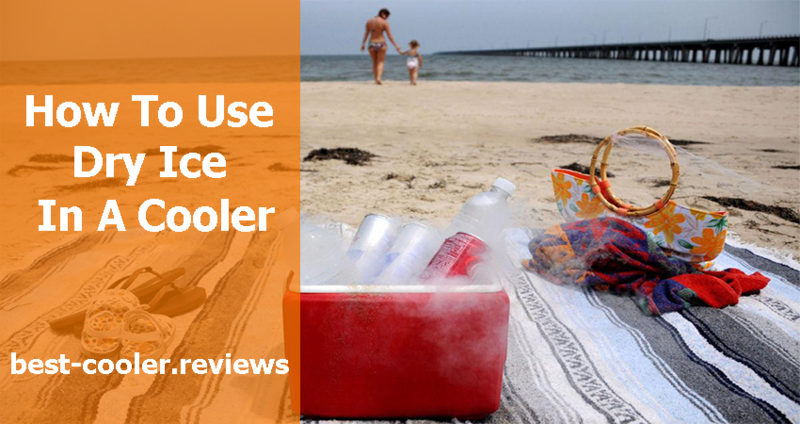 Most of reviews that we have read were positive, but there were several Amazon reviews where users claimed that the electric motor of this cooler has burned out less than week’s use. What can be better than take a bottle of cold beer from the cooler or mini fridge with a shape of beer can? Next our representative is this unique and stylish 12-volt electric iceless cooler that will add fun and style to each party and attract a lot of attention of your friends. This is a perfect option for pool party, or barbecue at the backyard with your friends. The body of this stylish cooler is made of heavy-duty plastic. Thanks to this fact its weight is nearly10-pounds that makes this cooler very convenient to carry, and makes it very portable. Measures of the cooler are 17.8” x 11” x 11”, that allow you to put up to twelve two-liter bottles or cans. As well as the previously mentioned electric cooler this model can also chill its content up to 40-degrees below the ambient temperature. Amazon reviews are split about 50/50 in regard to purchase or not this electric cooler. Some users are fully satisfied with its quality, while some of them are very displeased with its characteristics. .The penultimate participant of our list proves with its style that retro-design will never become old-fashioned and with the running of time such design become more and more cool and unique. 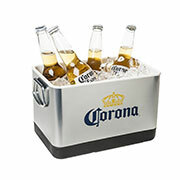 This 13-liter Corona metal cooler by Koolatron is probably the most interesting and unique option in our list if we speak about style. With the measures of 9” x 11.5” x 14.5” and capacity of 13-liters you can put up to 12 bottles or 18 cans with your favorite drinks. Body of this stylish cooler is made of durable stainless steel. Also you will find the swinging lock, durable and convenient chrome handle and polished chrome accents over the cooler’s corners. This product is not state-of-art model and can’t boat of premium-class characteristiccs, but with such eye-catching design you can be sure that all your friends will appreciate your new cooler. For more information you can check the product page on Amazon. The last option in our list is the representative of soft coolers. Among distinctive features of soft coolers there are incredible convenience, portability, light weight and easily-cleaning material. With convenient strap you can easily carry this cooler on your shoulder wherever you decide to go. This cooler will be a perfect option to take to the beach, picnic, lake or wherever you decide to. 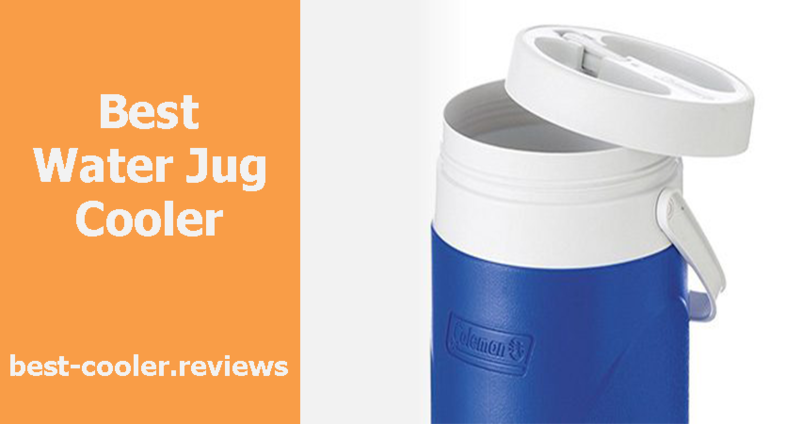 This soft cooler has measures of 8” x 8” x 10” and can hold up to 12 bottles. Cooler is made of durable nylon that will withstand all negative weather conditions and other interventions that may damage cooler’s material. With such easily cleaning and durable material this cooler will serve you many years. 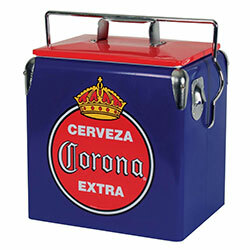 Moreover, this cooler is the officially licensed Corona product and is available on Amazon right here. Perfect option for fun party and great relax. For more information follow this link: more info here. 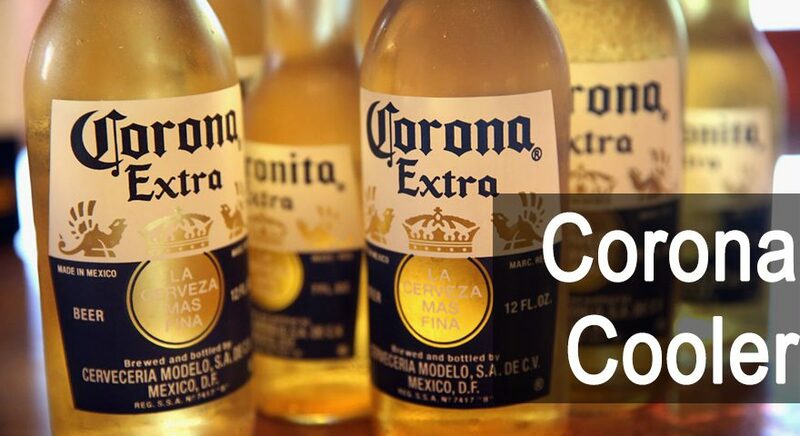 Beside high-quality features, excellent performance and stylish design Corona manufacturers prepared a wide range of available accessories to your new Corona cooler. Each of them is really cool and will be a worthy addition to each cooler from the Corona lineup. In this paragraph we have picked up the most interesting and popular among users accessories available on the market nowadays. This accessory has been created especially for fun serving drinks at your next party. This simple unique little beer/ice bucket will not cost you a lot of money but impress your guests greatly. It’s funny that this Ice Bucket can provide you with the same insulation as the standard cooler. In fact the main difference between the normal cooler and this Ice Bucket is the absence of lid and title ‘beer bucket’ instead of usual ‘cooler’ title. 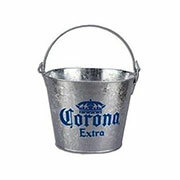 With the measures of 11” x 7” x 7” this bucket can hold six cans with beverages (ice included). One more fun and interesting thing is this beer/ice bucket. Perfect option to serve cold beer to guests of your party. This ice bucket unlike the previously mentioned option doesn’t have insulation, so you must hurry up when giving cans with beer to your friends before the ice inside bucket starts melting. This ice bucket is also equipped with opener for bottles that is very useful at the parties. With the 7 ¼” tall x 8 ¾” top diameter x 6 ½” bottom diameter the ice bucket is created for holding up to six bottles/cans with beer. Bucket is made in Mexico. The next accessory in our list is this great combo of bottle opener/cap catcher. Designed by Brown Manufacturing from Atlanta GA this small hero will not leave you indifferent. Incredibly useful thing in each party, picnic, barbecue and so on. You can also install it permanently to the wall or bar top. This accessory comes with the special mounting screws that will help you instant it without any efforts. The dimensions of the bottle opener are 3 ¼” x 2 ⅝” while the dimensions of the cap catcher are3 ⅝” x 5 ⅝” x 2 ⅝”. Simple, useful, qualitative thing. 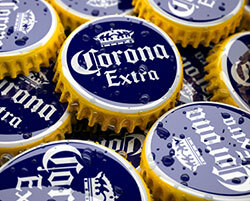 Corona manufacturers have decided to impress us completely and created a unique lineup of Corona beer bottle cozies. 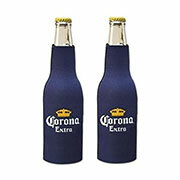 Qualitative and stylish koozies will perfectly complement your collection of Corona products. Modern style and high quality from world famous manufacturer. All you have to do is to pour beer inside it and relax. 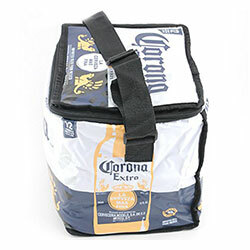 All Corona cooler products that have been described here can be found on Amazon.